Monday has ruthlessly savaged me and I'm in need of some cheering up. Enter Norah Jones and her "Happy Pills." Video. Buncha pervs, the whole lot of you. 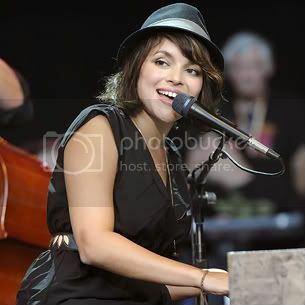 The evolution of Norah Jones from spellbinding singer of songs bursting with nocturnal radiance to spellbinding singer of any damn thing continues with "Happy Pills," a song she co-wrote with Brian "Danger Mouse" Burton for her upcoming album Little Broken Hearts. I love the work Jones and Danger Mouse did on the Rome soundtrack and while "Happy Pills" doesn't have the same sweeping weirdness, it is a finely crafted pop song that has only increased my anticipation for the record in full. The single was released on iTunes and Amazon a month ago and the album doesn't drop until May but we do have a video for it and I have two words for you, dear friends: shower scene. If that doesn't help fix a Monday where nothing has gone right, there isn't much point in continuing. I regret to inform you the video is safe for work but c'mon... the internet hasn't completely destroyed our capacity for imagination, has it? While you're feasting your eyes on the freshly showered Norah, remember tickets for her upcoming tour go on sale very soon and don't forget to pre-order your copy of the record. Several of us at BlindedBySound are Jones fans so I have a hunch a few of us will weigh in on this record.